For this circuit with the above component values I recommend the DS2Y-S-DC5V relay or a similar one. To slow down the jumping back and forth, I’ve used a capacitor on the input of the inverter. The resistor R1 controls how much current that goes back to charge the capacitor on the input. The size of the resistor R1 and the capacitor C1 will, therefore, determine the blinking speed. 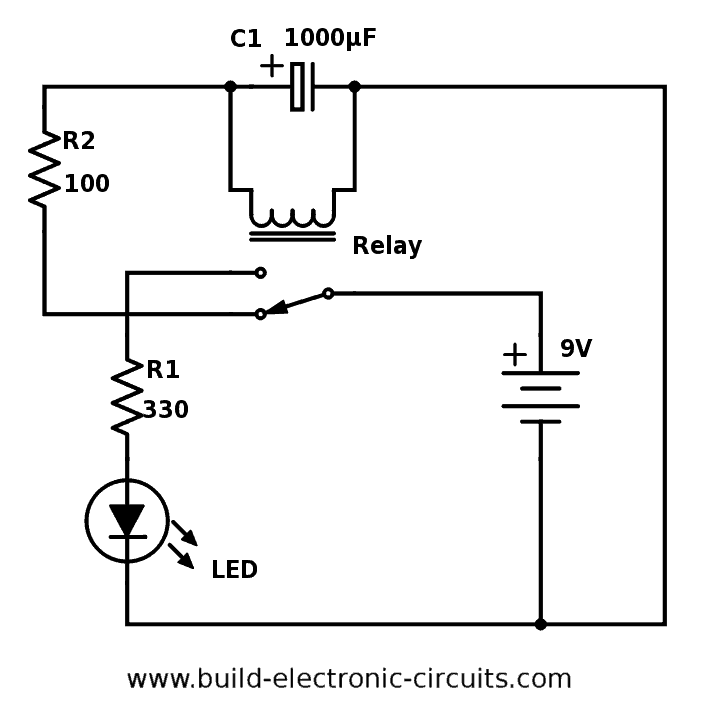 your explanation on relay circuit is not so clear…..plz elaborate schematics connection and its operation…….capacitor and relay are connected in parallel so it will always turn on the led..
Not sure what you mean.. The circuits are working fine. always current chooses the low resistance path ,so whenever the movable part of the relay is connected to the parallel path of the led, the current prefers to flow through ‘8’ but not ‘4’, because in forward bias the led has 10-100 ohms resistance which is greater than internal resistance of wire. This is a good explanation of how the relay blinker works. You need to learn how electrons flow through a circuit. Charging and discharging the capacitor slows the switching of the relay so you can see the led turn on and off. The ppage is headed “Blinking LED Circuit with Schematics and Explanation”, but there doesn’t seem to be any schematics. just the explanation and one photo. There are schematics too. Try reloading the page. c=2000uf, R3=390ohm.Could u tell me how you choose the values. Ohm’s law is how he wound up with those values. What you need to do is pick your power supply voltage, ie:9volts, then you calculate your load current= total of all your loads, as in the loads of leds probally have around 3mA each, so you add 3mA+3mA=6mA, you then convert mA to amps 1000mA=1Amp, in this case 6mA/1000= .006 mA You now have your Volts, and your ( I )Current, so Ohm’s law states V/I = Resistance(Ohms), 9volts/.006mA=1500ohm. Study Ohm’s law, it will help out alot and save your life too!!!!! Typo error: 6 mA can’t also be .006 mA. A have a Samsung TV locked with Keyword. What do I do to unlock it. Im trying to do a similar project, but utilizing 3 LED’s in sequence instead of two. 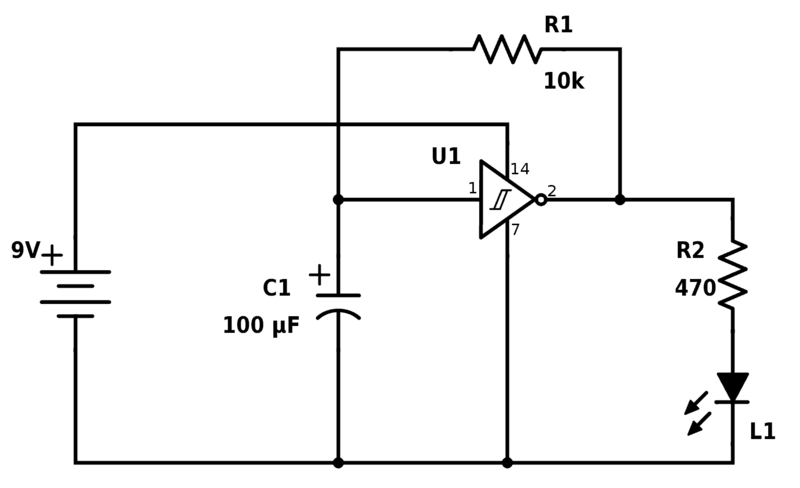 Any ideas on how that could be accomplished utilizing a similar circuit? How to you want the LEDs to blink? All three ON and OFF at the same time? Only one ON at any one time? Perhaps you are just a poor student. Please give me a introduction of a blinking leD’s without arduino. 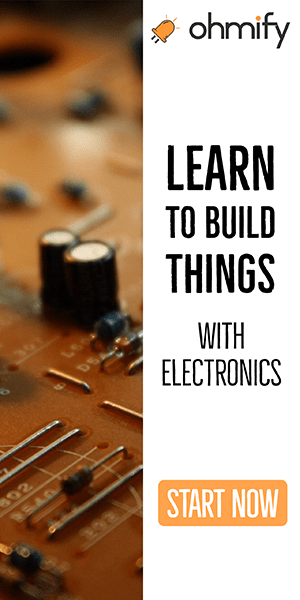 Plsss..
There’s no use of Arduino in this article. So I’m not sure what you mean. 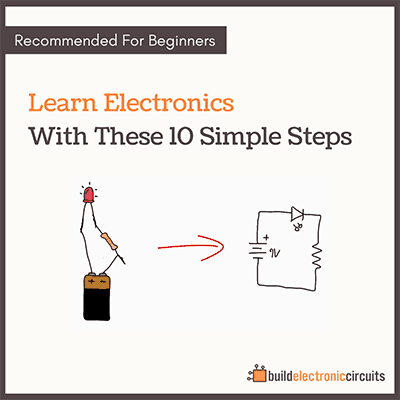 Can you recommand me an ebook can be helpful to gain a thorough knoweldge of making electronic circuits? Thanks for article. Can you please explain about battery & how to power up circuit ? Thanks for article. Can you please explain battery & how to power up circuit safely ? For the circuits in this article you don’t have to worry about safety. They all use very low power. These comments seem to come mainly from “experts” who wish to glorify themselves at the expense of the site’s author. First, one wonders why an expert would be looking at a page for such a (presumably) simple circuit, given their expert status. Those seeking the “explanation” obviously missed the very obvious link to the more technical information,. Can you design me a blinking LED death ray? You are the king of blinking LEDs after all! 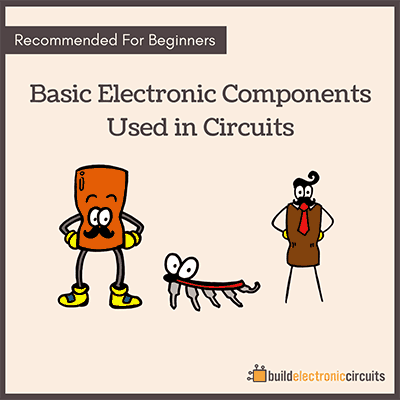 —Guys the author of the site is trying to introduce you to some basic electrical/electronic concepts using circuits as examples to try and learn from. He’s not offering you a fish, he’s trying to teach you to fish. Poorly Done, etc etc etc…. — How long did you spend on your your website, stooping from your “expert” throne into the —gutter with the rest of us, just to “Help a newb learn something” ??? You might consider the questions from experts as a sort of pier review process. Weather they are self aggrandizing or not is in the mind of the reader. Our teacher is only human, and a little polite help, I would hope, would be welcomed. Some times we over look that which is obvious to us, but murky to the beginner. Thank you for publishing this online for all to use. Can I place two additional LEDs in parallel (one additional for each side of the circuit so that I end up with alternating pairs) without having to modify any part of the circuit or increase the input power? Thanks. Yes, you can. They might be a bit dim though. In that case, change the two 470 Ohm resistors to two 220 Ohm resistors. It helped me IN my physics project. 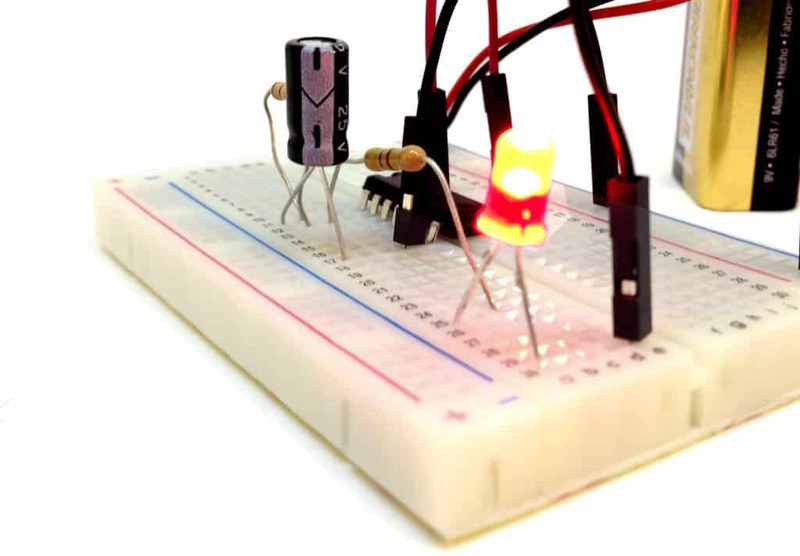 Can I see a Video making the Blinking an LED Using Relays? This is very useful in our thesis. But Iam not good in electronics. I will be very thankful sir if you help me :( I just need this for me to pass our subjects, and also to help my classmates/group mate. Iam hoping for you reply sir. I don’t have that at the moment. I’m updating the article with a better schematic and component values now. I mixed ON and OFF there. Fixed it now. Was that what you meant? I have always been curious about how blinking lights work, so reading your article and learning how a relay coil uses an electromagnet to route power to a light on and off making it blink was really cool! My dad loves electricity so he is always talking about things like this, but I have never understood what was happening. Maybe I just need to buy a relay and try to figure out how to work with it. Great to hear you enjoyed the article. And yes – you should buy a relay and test it. Hi, just wondered if you know how them flashing LED bollards work on the motorway road works. The ones I refer to are the ones that flash in a sequence without actually being connected to each other. You see them where the cones start to reduce two lanes down to one. I’m not familiar with them, but if there is no cable between them, there’s probably a wireless signal that keeps them in sync. …and just by replacing the timing resistor with 2 diodes and a pot(entiometer) you can make a dimmer or speed controller from the inverter circuit above. How do i calculate my own value, what if i wanted to try other value than 9 volts. How do i calculated value for each project, ex. Charged capacitor, resistor etc. Is it hard ? Can you show me step by step ? Why do you need to use charged capacitors , why not normal one , what is the difference ? Why does adding of the capacitor in the last project makes the led blink slower ? I can ‘t think of it. Um… I can ‘t quite imagine what happened in the last project is it 1 run vice versa with 2 and 16 run vice versa with 8. And current from battery run to 16 and goes 3 ways 2,1,8 the one that go to led have the same state as the capacitor. If there are high current running in led ways, there are also high current running to capacitor and the capacitor are charging and when the capacitor is charging it lets the led light ( just like in project with transistor ) and when it’s fully charged then the led went off…. Then I can’ t go on what happened . Is it correct ? If I was setting values how many times does R1 and R4 have to be more than R 2 and 3. How do I calculated this? Love the inverter blink circuit! What values need to be changed to use it with 12 volts dc? I have a 12v LED switch I want to blink. What inverter IC do you recommend using at 12v? Check out the HEF40106, it’s available in a version that accepts up to 15V supply voltage. I am in serious need of a circuit that blinks an LED once every 15-20 seconds. It has to run on 12volt DC. I need it to not be too high a current draw (if possible) so as to not run down the vehicle’s battery. Car stays dormant for 2 weeks at a time. I do have a car alarm BUT it does not have a blinking light on the dash. I need to discourage would be thieves. PS. I build and restore hot rods and muscle cars. Am Kris… Thanks i have tried one with a relay bt its noisey. Some time 2002 i had a casset with a sound level lighting led. The louder the music the brighter the led would glow… How can i make this a gain please help me out. In my new projects av tried lighting using 2 3 and 4 switches agaist one light. Am Kris from Uganda. Inthe first circuit picture you said the light blinks so fast you can’t see it. How fast does it blink? How fast can you make a light blink, and how do you accomplish metering it’s blink speed? It blinks as fast as it can. It’s a mechanical process that needs to take place and this will happen as fast as it’s possible. How fast depends on the relay, I’ve never measured that. Can germanium transistor also make a led blink? I am a newb to electronics. In these circuits you are using standard LED’s. What if I am using a flashing LED? I am building a model car for my daughter and want to make the turn signals blink. I have flat top 5mm LED’s that I am connecting fiber optic filament to bringing light to the different flashers. I am trying to make the circuit as small as possible (trying to fit it in the trunk). I’m figuring that I need a battery, resistor and a on-off-on micro switch (left and right lights) but want to make sure I’m not missing anything. If you have LEDs that are flashing “out-of-the-box”, that means they have the falshing-circuitry built in. In that case you only need what the LED requires which I am guessing is only the correct voltage. And a switch to turn it on and off, yes. Can you explain why in example 2 the capacitor is in parallel with the relay? It seems to me that it would work in series with the relay, and I can’t figure out how it works when it’s in parallel. If the capacitor were placed in front of the relay I imagine that it would continue to feed current into the relay for a short time after the gate to the LED has opened, thereby keeping the gate open a little bit longer. But in parallel I can’t see what purpose the capacitor serves. It looks to me like it just sends stored current back to the battery and doesn’t do anything to keep the relay on. Can you clarify? Never mind, I think I misunderstood how and in what direction capacitors release their charge. As the capacitor charges, the voltage increases and after a while the voltage is large enough to put the coil to work. 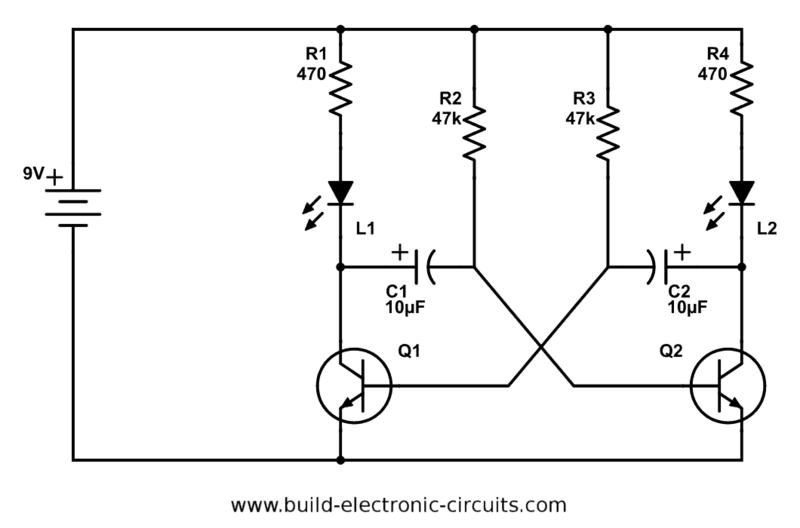 In “Blinking an LED Using Relays” circuit what is the rule of the resistor R1? 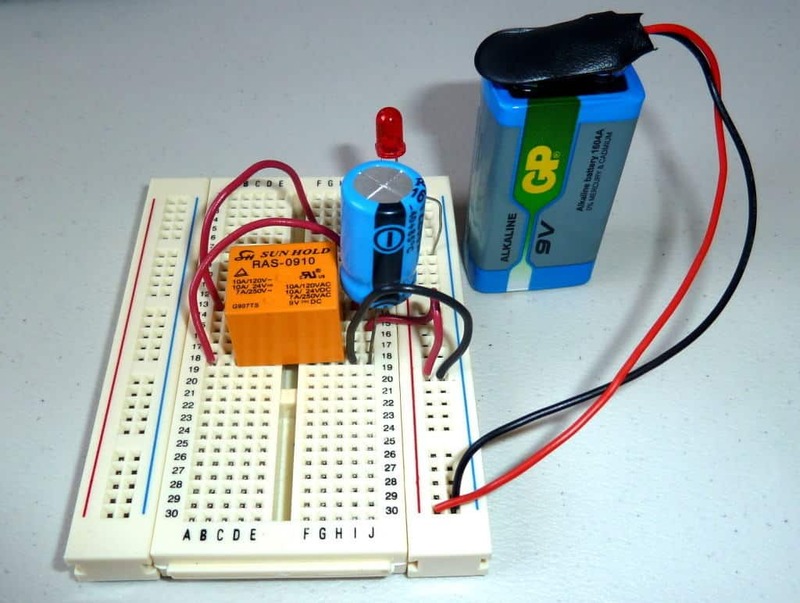 I Read How To Blink An LED With An Inverter on your website. Sir, i have a question ? Can this circuit works with proper connection with inverter made using transistor (not using inverter ic). In example 2, what are the values/Nos of Q1 and Q2? In example 3, what is the value /No of U1? Thank you. That would control a big maximum of 10 amp on a 120v circuit. Hey, you can find people on upwork.com to these kinds of jobs. Good luck! I have made a blinking led with inverter but the blink speed is too low and varies continuously. How to increase the blink speed? Lower values for the capacitor and/or resistor will increase the speed. I need a 555 timer circuit that, when power is applied, will turn on an led for five minutes and then start blinking the led continuously at 1 second intervals. I was wondering if this can be done using a single 555 timer? A transistor could be used if needed. what is the results of this The experience? In the second method, the one that uses transistors, which transistors should I use? Do the leds blink at once or not? And if I want to change the blinking frequency, what should I do? I have tried with that second method which uses transitors but i found the leds are very very dim and not blinking. Should i increase input voltage from 9v to 12v or what should i do? Increasing the voltage won’t help. It might even damage the LED. If the LEDs are both lit, but dim, there’s a chance it’s blinking so fast that you can’t see it. Try increasing the value of R2 and R3 – or C1 and C2. Increase in steps of 10x. Ex: if you are using 10µF for C1 and C2, try using 100 µF. Or if you want to increase R2 and R3: If you are using 47k now, try 470k. You can’t cut the circuit in half, no. But you can, of course, remove one of the LEDs. Please explain why the relay does not have magnetic field to pull the switch as it is connected to the plus side and minus side of the battery directly. The capacitor is also connected across the relay coil, plus and minus sides. So how does the capacitor cause delay since the coil is also connected directly to the battery supply??? 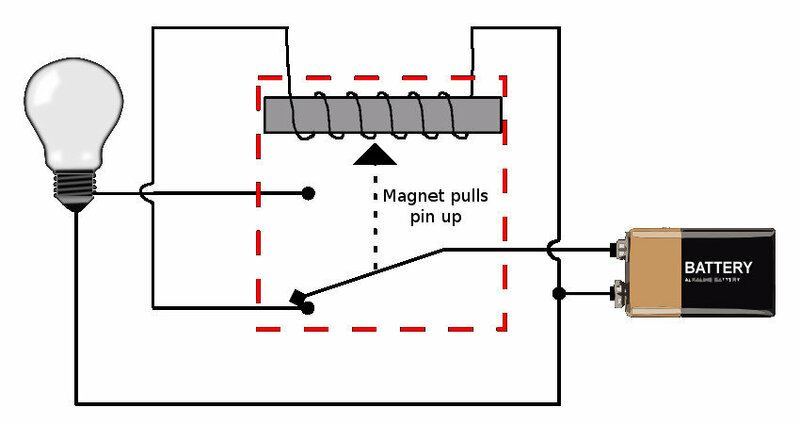 It does get a magnetic field to begin with, and that pull disconnects the battery from the coil so that it should lose the magnetic field. But since the capacitor is connected across the coil, the capacitor keeps the coil magnetized for a bit more. Finally, the capacitor is discharged and the magnet stops pulling the pin upwards.